Home | Discount Leotards ™ > Grips, Grip Bags, Balm, Etc. 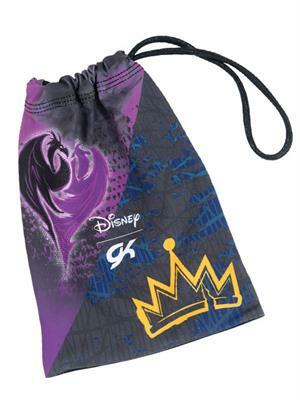 > DSY055 Daring Fairest Descendants - Disney © Mal Evie sublimated subfuse gymnastics grip bag. Feel the power of doing what's right in this Disney Descendants - Maleficent, the Evil Queen, Jafar and Cruella De Vil - inspired sublimated subfuse grip bag. GK’s policy: Pilling may occur on PolyTek and SubFuse Sublimated fabrics when it comes in contact with any other rough surface, examples are mats, grips, floor mats, etc. The back/bottom area of the garment tends to pill easier than other areas. Unfortunately this is an issue we cannot avoid due to the nature of the fabric. Elite Sportswear will not be responsible for replacing or repairing your garment if pilling occurs. DSY038 Fairest Descendants - Disney © Mal Evie sublimated subfuse sprayed with gold metallic V neck gymnastics leotard.